Hello Everyone!! Hope everyone is having a great day!!! I have a busy day today so many things going on. I am hoping to get into my creative office today. I have things to make; surprises for special people. I don't want to reveal too much. I have an album that I did a little while ago that I haven't posted the pictures for as of yet. I will do that sometime this week. I have another one that I am currently working on as well as a video for the special people in my life (my Mom and Step Dad). I made a video of their wedding, Smoky Mountain Trip and Cruise to Caribbean. I enjoy doing these videos. I also make many for our son in his events through school. 8 1/2 x 11" Cardstock your color choice cut 5 1/2"
Cut your card stock to size for A2 card. Then place decorative paper centered over top. 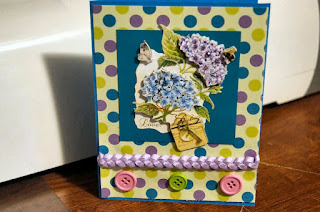 Then you may add another piece of complimentary paper to place behind your embellishment. The placement of your ribbon is up to you. I like to see how the flow of the card is going as to where I place my ribbon. Then you can place your buttons where it would be complimentary on your card. Then you are finished. Beautiful card Leah! I have those exact stickers, but have not used them yet! They really are lovely and such a bargain :) I have not even started on my Mother's Day cards yet - I think I am in trouble!